The ecommerce world is evolving. Where we once only saw one-time product orders, we’re now seeing a growth of recurring, subscription-based services. You’re likely familiar with at least some of these types of ecommerce services. HelloFresh delivers pre-portioned ingredients to make homemade meals right to your door. BarkBox delivers a collection of dog toys and treats on a monthly basis. Dollar Shave Club sends you affordable, high-quality personal grooming supplies for less than you’d pay at the drug store. Even Amazon is getting in on subscription services by allowing you to “subscribe” to certain recurring purchases (e.g. paper towels, dog food, laundry detergent). Subscription services these have taken the ecommerce world by storm in 2019. In fact, whether you’re looking to start a new ecommerce business or upgrade your old one, it may be a model worth considering for yourself. Keep reading to learn some helpful tips about starting a successful subscription service and to learn what makes successful subscription box companies in different niches. How Successful are Ecommerce Subscription Services? An ecommerce subscription service is a service that collects a recurring payment in exchange for recurring product deliveries or on-going service. Curation – The customer receives a curated collection of items, often within a specific category. The longer the customer remains a subscriber, the more tailored the collection becomes. The key value customers receive is the surprise factor based on collection variety. Replenishment – The customer receives automatic shipments of the same or similar items, often at a lower cost then retail. Common examples include commodities like coffee, alcohol, nutritional supplements, and food. Access – The customer receives access to exclusive items or services such as instructive courses or exclusive product releases. In many ways, ecommerce subscription services are mutually beneficial for subscribers and for the companies themselves. The customer receives the convenience of recurring shipments and/or curated collections while the company receives the security of guaranteed, recurring payments. But who actually uses subscription services, and how much potential is left in this market? About 15% of online shoppers have subscribed to an ecommerce subscription service within the past year. Over 50% of ecommerce service subscribers have more than one active subscription. 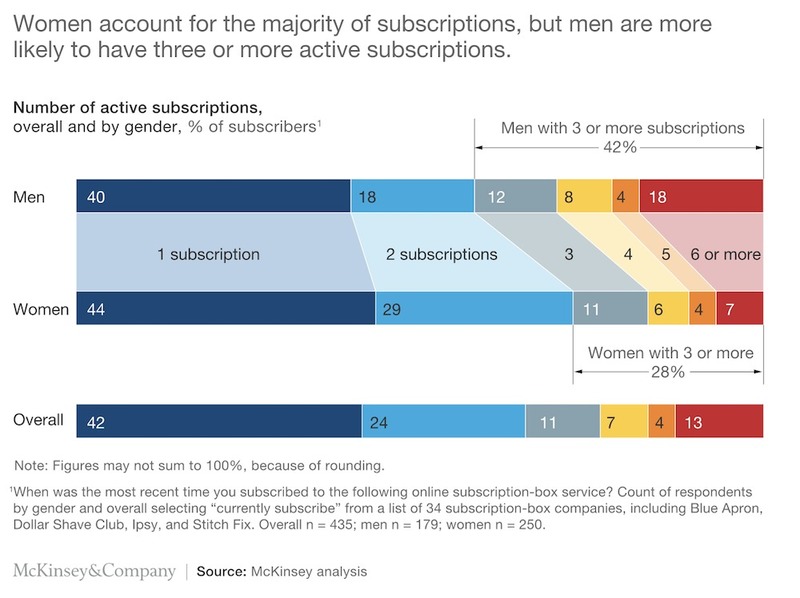 Nearly 20% of male subscribers and 7% of females claim to be subscribed to at least 6 ecommerce services. Online revenue for large subscription services grew from $57 million in 2011 to over $2.6 billion in 2016. Now that you know a little more about subscription services and how they work, let’s take a look at some of the best subscription service markets and examples of successful companies in those niches. The key to success with an ecommerce subscription service is three-fold. You need to find the right price to entice customers to subscription but that still offers you an attractive profit margin. You also need to provide the customer with convenience and valuable service to encourage them to keep their subscription active. Churn can be the death of any ecommerce subscription service. Forbes estimates that the beauty industry is worth over $445 billion. Since the early 20th century, the market has largely been dominated by a small number of multi-national corporations like L’Oreal, Estee Lauder, and Procter & Gamble. Beauty box subscription services like BirchBox, Ipsy, and BoxyCharm give customers access to sample-sized products at an affordable price. Ipsy is a subscription service for beauty products including makeup, nail polish, fragrances, and skincare products. A $10 monthly subscription buys you 5 sample-size products selected based on your preferences. You also receive a discount when you order a full-size product from your Glam Bag. The worldwide fashion industry is expected to rise from just over $480 billion in 2018 to more than $712 billion in 2019. While brick-and-mortar retail stores are closing their doors all over the country, ecommerce sales are at an all-time high. Personal style box subscriptions like Trunk Club, Stitch Fix, and Gwynnie Bee provide customers with a customized collection of clothing, shoes, and accessories for a monthly subscription fee. Trunk Club is a subscription service provided by Nordstrom and offers personal styling and the potential to earn Nordstrom rewards. To start, you create a style profile and chat with a personal stylist to determine your needs and preferences. Each month, you receive a collection to try on and you have 5 days to decide what to keep and what to return. Survey data indicates that nearly 20% of US adults have tried a home delivery meal kit service and nearly 4 in 10 are current subscribers. Furthermore, the meal kit delivery service market is currently valued at over $5 billion. Services like Blue Apron, Hello Fresh, and Sun Basket receive as many as 4 million visitors each month with total monthly visits topping over 11 million. Sun Basket is an organic food subscription service in which customers receive weekly deliveries. Subscribers choose from 18 weekly recipes and receive the fresh, pre-portioned ingredients to prepare those recipes in 30 minutes or less. Paleo, gluten-free, and vegan recipes are available. Statistics show that more than 50% of Americans over the age of 18 drink coffee every day and, furthermore, the average American drinks about 3 cups of coffee per day. Specialty coffee sales are increasing at a rate of nearly 20% per year, and the U.S. coffee market alone is estimated at a value over $18 billion. Coffee box subscriptions like Atlas Coffee Club, Counter Culture, and Trade Coffee provide subscribers with the opportunity to try coffees from around the world at a monthly price. Atlas Coffee Club is a monthly curation service for coffee. Subscribers receive a monthly curated collection of different coffees from around the world. Each month you receive 12 ounces of freshly-roasted coffee along with flavor notes, a postcard, and brewing tips. About 94 million U.S. men aged 15 and older shave, and about 75% of men shave their face every day. Though personal styling preferences vary, over 1.3 billion men worldwide shave using a razor. Shaving box subscriptions like Dollar Shave Club, Harry’s, and The Beard Club provide monthly shipments of personal grooming supplies including razors, shaving cream, moisturizers, shampoo, and more. Dollar Shave Club is a monthly subscription service for personal grooming products, but primarily shaving products like razors, shaving cream, and aftershave. Subscribers choose from three starter kits priced $5 to $12 and receive monthly replenishment of their favorite products. Socks are a commodity item, but they are also a basic fashion necessity. It may surprise you to know that the sock industry is surprisingly lucrative. The specialty sock market in the United States is expected to grow by nearly 2% per year. Sock subscription boxes appeal to men and women of all ages and offer a wide selection of options in services like Sock Panda, Sock Fancy, and Sock It to Me. Sock Panda is monthly curation service for men’s, women’s, and children’s socks. Subscribers receive a monthly delivery of socks based on their size and style preferences. Choose from patterns and prints or wild and crazy designs, opting to receive one pair or two pairs each month. According to a 2017 survey by the Bureau of Labor Statistics, Americans aged 15 or older spent an average of nearly 17 minutes per day reading, not including for work or school. Though audio books are the fastest growing format for sales in the United States, many people still prefer the feel of a real book in their hands. Book box subscription services like Book of the Month, OwlCrate, The Bookish Box cater to readers who like to stay up to date on the latest releases. Book of the Month Club curates a selection of five books each month with an emphasis on early releases, debut authors, and fresh perspectives. Subscribers choose one of the five books for $14.99 each month with the option to add more books for $9.99 each as well as the option to skip a month. The average American eats more than the recommended daily allowance for things like sodium, saturated fats, and processed sugar but the healthy food industry is still a big money-maker. Though nearly 36% of American adults are obese, about 75% of Americans say that they try to eat healthy. Healthy snack boxes like Graze, Nature Box, and Snack Crate offer healthy options for snacks that go beyond the traditional choices like fresh fruit and vegetables that many people find boring. Graze is a curation service in which subscribers receive a selection of 8 healthy snacks every two weeks. Subscribers fill out a profile with their preferences and provide feedback after each shipment for a more personalized selection with the following delivery. Customers can also buy their favorites in bulk. According to the American Pet Products Association, more than 85 million households own a pet and pet ownership has increased to 68% over the past few decades. Not do more Americans than ever own pets, but they spoil them. The American pet industry has an estimated value of over $72 billion. Monthly pet supply boxes like BarkBox, Cat Lady Box, and RescueBox appeal to pet owners who like to pamper their pets with new toys and treats on a monthly basis. BarkBox is a monthly subscription service for dog toys and treats starting at $25/box (valued over $40). Subscribers fill out a profile with their dog’s name, size, and dietary preferences, then choose a monthly subscription or 6-month subscription plan. Customers can also reorder items on the BarkBox website. Starting an ecommerce subscription service is fairly simple. However, it’s structured much differently than a traditional ecommerce business. Whereas with a normal ecommerce business you increase your margins significantly to make a profit on each sale, in a subscription-based ecommerce model you tend to keep your margins much lower. Why? This low price is the hook that brings in the customer and keeps them on the service month after month. True profits come only after the customer has been on the service for a while. This is the riskiest part of owning any subscription-based service. If the customer leaves after one or two subscription orders, you could be left with minimal (if any) profit. On the flip side, if you’re able to get customers to stay with your subscription service for the long haul, those profit margins start to add up. Whether you’re an established ecommerce store looking to take your business to the next level or you’re looking to start your ecommerce journey, consider the benefits of a subscription-based service. Dan Scalco is an ecommerce consultant who owns Digitalux, a digital marketing agency located in Hoboken, NJ.